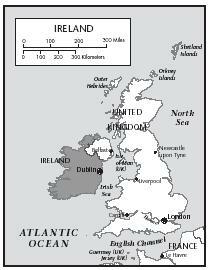 Ireland, or officially the Republic of Ireland, is an island nation in the North Atlantic Ocean. 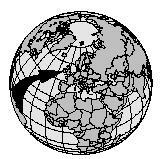 (The northernmost part of the island is Northern Ireland, which is part of the United Kingdom.) Almost 20 percent of the land is devoted to farming. Less than 10 percent of farmland is used to grow crops and the majority is used as grazing land for livestock. The arrival of the Anglo-Normans in Ireland in 1169 affected both farming and diet in Ireland. (Anglo-Normans are the Normans who remained in England after the Norman Conquest. Led by William the Conqueror, the Normans came from the Normandy region of France in 1066.) Wheat, peas, and beans became staple foods and people began preparing more elaborate dishes. Food customs were also changing, as French and Italian cooking customs influenced the upper-class cuisine. stopped, the potato returned its place as the staple food in the Irish diet. Farmers began to spray their crops with chemicals to protect them from disease. As of 2001 the Irish were consuming more potatoes than most countries in the world. Irish food is known for the quality and freshness of its ingredients. Most cooking is done without herbs or spices, except for salt and pepper. Foods are usually served without sauce or gravy. The staples of the Irish diet have traditionally been potatoes, grains (especially oats), and dairy products. Potatoes still appear at most Irish meals, with potato scones, similar to biscuits or muffins, a specialty in the north. The Irish have also been accomplished cheesemakers for centuries. Ireland makes about fifty types of homemade "farmhouse" cheeses, which are considered delicacies. Soups of all types, seafood, and meats also play important roles in the Irish diet. Irish soups are thick, hearty, and filling, with potatoes, seafood, and various meats being common ingredients. Since their country is surrounded by water, the Irish enjoy many types of seafood, including salmon, scallops, lobster, mussels, and oysters. However, meat is eaten more frequently at Irish meals. The most common meats are beef, lamb, and pork. A typical Irish dinner consists of potatoes (cooked whole), cabbage, and meat. Bread is an important part of Irish culture. Fresh soda bread, a crusty brown bread made from whole-wheat flour and buttermilk, is a national dish of Ireland. Irish bakers don't stop with soda bread, however. They bake a wide variety of other hearty breads and cakes. The most common everyday beverage in Ireland is tea. Popular alcoholic beverages include whiskey, beer, and ale. Coffee mixed with whiskey and whipped cream is known throughout the world as "Irish coffee." To make Irish stew, all the ingredients are assembled in layers in a large stew pot. Begin with layers of sliced potatoes, onions, and carrots. Top with a layer of Canadian bacon and lamb. Repeat these steps until all the ingredients are used. Add enough water to just cover the ingredients. Arrange the halved potatoes on top of the stew, but not in contact with the water, so they can steam as the rest is cooking. Simmer over a very low heat for about 2 hours. Sprinkle liberally with the chopped parsley and serve in soup bowls. Irish Soda Bread, loaded with raisins and caraway seeds, is cut into wedges and served with sweet butter. This is one of the most widely eaten potato dishes in Ireland. 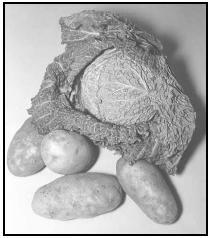 Scrub potatoes (do not peel), place them in a pot, and cover them with water. Heat the water to boiling, and cook the potatoes until they can be pierced with a fork (about 25 minutes). Finely chop the scallions (use both the white bulbs and the green stems) and put them in a small saucepan. Cover the scallions with the milk and bring slowly just to a boil. Simmer for about 3 to 4 minutes, stirring constantly with a wooden spoon. Turn off the heat and let the mixture stand. Peel and mash the hot boiled potatoes in a saucepan. Add the milk and scallions mixture and beat well. Beat in the butter. Season to taste with salt and pepper. Serve in 1 large or 4 individual bowls with a pat of butter melting in the center of each serving. May be reheated. The most festive holiday meal of the year is Christmas dinner, followed by Easter Sunday dinner. During the 40 days of Lent, Irish Catholics choose certain foods they wish to not eat. At one time, all animal products, including milk, butter, and eggs, were not to be consumed during Lent. The poorer Catholics of Ireland were often left to eat only oatcakes for the 40-day period. On Good Friday, the Friday before Easter Sunday, the Irish eat hot cross buns, a light, bread-like pastry topped with a frosting cross that holds spiritual meaning. Another day on the Catholic calendar that the Irish Catholics do not eat meat is All Saints' Day (November 1). Each county has its own special meatless dishes for this occasion. Popular dishes include oatcakes, pancakes, potato pudding, apple cake, and blackberry pies. For Christmas, people throughout Ireland eat spiced beef, and a fancy Christmas cake full of dried and candied fruits for dessert. Potatoes and kale (or cabbage) are staples of the Irish diet, and form the main ingredients in Colcannon, a traditional Halloween dish. The day before baking: Combine all the fruit, peel, rind and juice, spices, and nuts in a large bowl with ½ cup of the whiskey (or tea) and let soak overnight. The day of baking: Preheat oven to 275°F and grease a 9-inch round cake pan, lining the bottom with cooking parchment paper. Beat the eggs in one at a time, adding flour with each egg. Mix in the remaining flour and soaked fruit. Pour the mixture into the cake pan and bake until it is firm to the touch and a toothpick inserted into the center comes out clean, about 2 hours. Let the cake cool in the pan for 30 minutes. If substituting tea for whiskey, skip this step: Prick the top in several places and pour the remaining ½ cup whiskey over the top. Wrap in plastic wrap, then foil, and store in a cool, dark place for several weeks to allow the cake to mature (fully absorb the flavors). The cake can be unwrapped occasionally and more whiskey added, if desired. The Irish value hospitality, and generous portions of food are common at home and in restaurants. A large breakfast was traditionally eaten in rural Ireland. Common breakfast foods included soda bread, pancakes, porridge, eggs, and various meat products. A full oldfashioned country breakfast might include fresh fruit juice, porridge, a "mixed grill" of breakfast meats and black pudding, scones, and soda bread with butter and preserves, tea, and coffee with hot milk. Dinner, the main meal of the day, used to be eaten at lunchtime. A typical dish was "Dublin coddle," a bacon, sausage, potato, and onion soup. Today, however, many Irish people eat lighter meals in the morning and at midday. They have their main meal later in the day, when they come home from work or school. Lunch is often a bowl of hot soup that is served with freshly baked soda bread. However, many pubs (bars) still serve the traditional large midday dinner. "Supper" in Ireland means a late-night snack. A typical supper is a slice of bread with butter and a glass of milk. Separate bacon into slices and place them side by side in a large frying pan. (The bacon may be cooked in batches.) Fry over low heat, turning once, until crisp. Drain bacon grease from pan before cooking another batch. Drain the pan and wipe most of the bacon grease out with a paper towel. Place sausages in the pan to brown (again, the sausage may be browned in batches). Place bacon and sausages in a large pot. Drain frying pan again, wipe it with a paper towel, and add the sliced onions and garlic cloves, cooking them over low heat until the onions are softened. Add onions and garlic to the bacon and sausage in the pot. Add the thick slices of potato and carrot. Make a bouquet garni: In a 3-inch square of cheesecloth, place 1 bay leaf, ½ teaspoon tarragon, 2 whole cloves, and 2 whole peppercorns. Tie with twine, and place in pot. Cover everything with apple cider (or apple juice). Cover, and simmer 1½ hours over medium-low heat. The soup should not boil. Serve, garnished with a sprinkling of parsley and black pepper. The Irish are known for their rich, dark beer, called stout. The most famous and widely known brand is called Guinness. Tea is another popular beverage. It is served with scones, probably the most popular snack in Ireland. "Fish and chips," or battered and fried fish served with French fries, is also very popular. Preheat oven to 350°F and grease a 9-inch round cake pan. Peel, core, and slice the cooking apples and place them in a bowl. Sprinkle apples with the lemon juice and set aside. In another bowl, beat together the butter, lemon rind, and all but 1 Tablespoon of the sugar until light and fluffy. Add the flour and baking powder to the butter mixture and mix well. Spoon half of the mixture into the prepared cake tin. Arrange the apple slices on top. Mix the remaining Tablespoon of sugar and the cinnamon together in small bowl. Sprinkle evenly over the apples. Scatter the raisins and hazelnuts on top. Smooth the remaining cake mixture over the raisins and hazelnuts. Cool in the tin for 15 minutes. Remove, transfer to a serving platter, and sprinkle with powdered sugar. Modern Ireland has few problems related to availability of food. In the early part of 2001, Irish cattle and sheep farmers, like other farmers in Europe, were fighting against an outbreak of hoof and mouth disease, a deadly viral disease that is fatal to hoofed animals. By summer, the outbreak had been brought under control. Irish citizens generally receive adequate nutrition in their diets, and Irish children are considered healthy by international health care agencies. Allen, Darina. The Complete Book of Irish Country Cooking: Traditional and Wholesome Recipes from Ireland. New York: Penguin, 1995. Connery, Clare. In An Irish Country Kitchen. New York: Simon and Schuster, 1992. Drennan, Matthew. Irish: The Taste of Ireland in Traditional Home Cooking. London: Lorenz Books, 1999. Johnson, Margaret M. The Irish Heritage Cookbook. San Francisco: Chronicle Books, 1999. GoIreland.com. [Online] Available http://www.goireland.com/ireland/soda_bread.htm (accessed August 7, 2001). Ireland, The Food Island. [Online] Available http://www.foodisland.com (accessed July 9, 2001). good site. Excellent information and recipes! Well done to all the people who made it! this website is really great, really informative and the recipies are seriously tasty. 19/20 if anyone is bothered to rate this. Very well written and organized. Thank you for the information. Corned Beef with Cabbage is not from ireland. It's from New York City. I'm afraid some of this is way of the mark. I am Irish and have never eaten kidney soup. I would be horrifies to have to eat it on Christmas day. Here's a typical iriah Christmas dinner. starter: smoked salmon or melon, main course: turkey, ham, stuffing, brussels sprouts, roast potatoes, mashed potatoes, desert: Christmas pudding or sherry trifle. Also we don't have special food for all saint's day and there is no restriction on meat on that day. Good friday and ash wednesday (the first day of lent) are meat free. perhaps in years gone by but not now. we do have barm brac but we have it on halloween, the day before all saint's day.